In the past, it might have been exciting to soak up the sun and enjoy the wet breeze on a yacht, but times are changing, and the current generation thinks it's a boring journey, and they want an exciting new approach, if only on a yacht is not enough. The advent of the yacht inflatable water slides has brought new joy to the boring journey. 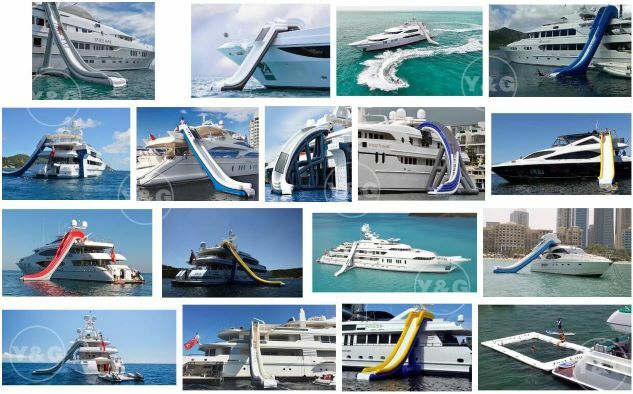 You may not have seen an inflatable water slide that can fit on a yacht, but now,yacht inflatable water slides are becoming popular.And we have designed and make the inflatable water slide on a yacht ,which can improve the yacht experience for our customers. The inflatable slide can turn your yacht into a water park. All you need to do is add some inflatable toys to your yacht and strengthening safety measures. Also，it can be custom-built to suit your yacht. The yacht inflatable water slide can be simply designed to hook onto a rail or be secured to your deck. The special yacht inflatable slide has a hook design on the top to be attached to your yacht handrail, so that you can easily climb onto the slide and slide into the water. The surface of this inflatable slide can be tailored to your yacht's style and color to make it more in line with the style of yacht. That's why your yacht is more fun than others, and with the yacht inflatable water slide, your yacht will become a special water park!